At Comrex we love great remotes and we love our animals, too! So you can imagine how giddy we were to receive the great story below from our friends at WDYL in Richmond, VA! In the midst of the allegations of illegal dog fighting, Atlanta Falcon's quarterback Michael Vick was scheduled to make an appearance for arraignment at a Richmond courthouse on August 26th. 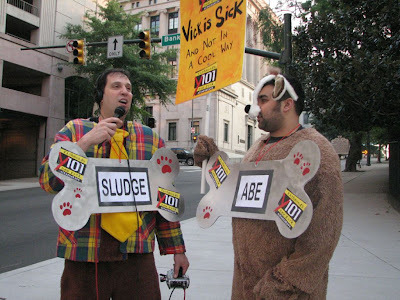 Enter Sludge and a few other "strays" from the Morning Sludge on Richmond's "Y 101 New Rock"! 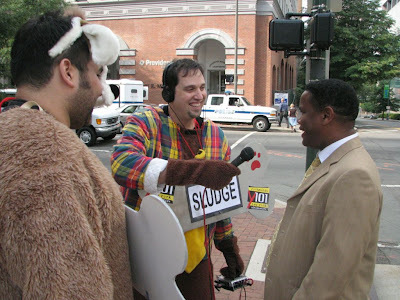 "This morning, our morning show team from WDYL was outfitted in dog outfits and did a live morning show broadcast from the front of the courthouse in downtown Richmond. This was all to do with the Vick controversy and he coming in to the courthouse. The live broadcast lasted for four hours straight using our new Comrex Access Portable and an EVDO card. 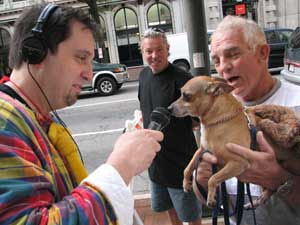 The morning show team was ecstatic with the system performance. 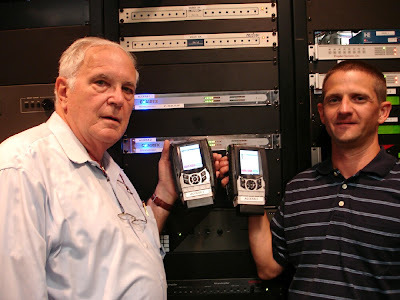 Sludge, the morning show host said, 'We could have not done the show with any other system. See the coverage on CNN, ESPN, WSB-TV Our COX Sister station in Atlanta and Inrich.com. They were inundated with interviews from the many media sources on the scene. provided by the Comrex Access system. ACCESS Portable - Very Popular with the Ladies!! !